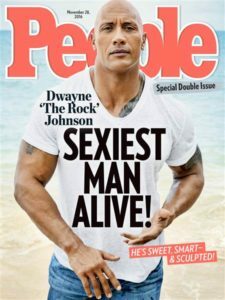 Former WWE champ Dwayne “The Rock” Johnson can add People’s “Sexiest Man Alive” title to his list of accomplishments. The wrestler-turned-actor was crowned this year’s winner Tuesday morning. The 44-year-old tells the magazine that the honor means he has “pretty much reached the pinnacle.” Johnson is set to discuss his new status with Ellen DeGeneres on her talk show Tuesday. Last year’s winner was British soccer standout David Beckham. Other recent winners include Chris Hemsworth, Adam Levine and Channing Tatum. Johnson has lent his voice to a character in the animated Disney film “Moana,” which hits theaters next week.